Today was a self indulgent day. The last couple of weeks have been draining. We all slept in and were lazy most of the morning. Lil 'g had received some money for Christmas and it was burning a hole in her pocket so I thought I would take her to the mall and try to take advantage of the Boxing Day Sales. The sales were crazy good. 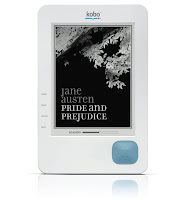 I treated myself to a Kobo. I had been researching them for a month and debating whether to go Kobo or go Kindle. I know you are probably thinking why not go with the iPad, well price for one, I have a great computer, and I am not into apps. The Kobo has been sold out for weeks before Christmas. A bit of restock arrived just in time for the Boxing Week Sales, they had 7 left when I got to Indigo! today. I didn't bother getting one put aside because I still was not sure if I was going to make the investment. So Lil'g and I browsed a bit. When I got to the checkout and said I would like one, "we are sold out" was the reply. In one hour, 5 days after Christmas they sold 7? Nope, make that 6, there was one left and I got it. And since I left my current read at my inlaws I am stuck for a book. Not anymore, I have 100 classic titles to choose from that came preloaded on my little kobo. So many to choose from, I don't know where to begin. I have decided to begin with Dracula and am loving it. Will I give up hardcovers? Probably not but the kobo is so convenient. I can take it with me to the doctors office which I am required to sit for 30 mins once a month (the staff always ask what I am reading this month). It will be great to take on the plane when I go to St. John's and Toronto too. I love getting lost in a good book. I am hoping I will have more time in 2011 to do just that.